These super cute Giga Tent Play Tunnels are ONLY $24.99 (Retail $59.99). This innovative and colorful Play Tunnel is ideal for children to crawl, slide and wiggle in for hours of fun. 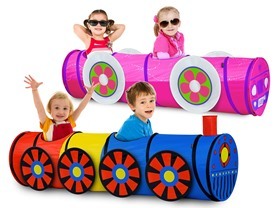 It comes with 4 attachable wheels (8 on the Train) and 2 attachable front and back entrance covers. This interactive tunnel is ideal for imaginative and creative play. It includes a reusable carrying case, so it can be taken and used virtually anywhere.